An atrial septal defect, or ASD, is commonly known as a “hole in the heart,” a congenital heart problem. While it is typically found in children, the problem may remain undiscovered well into adulthood. 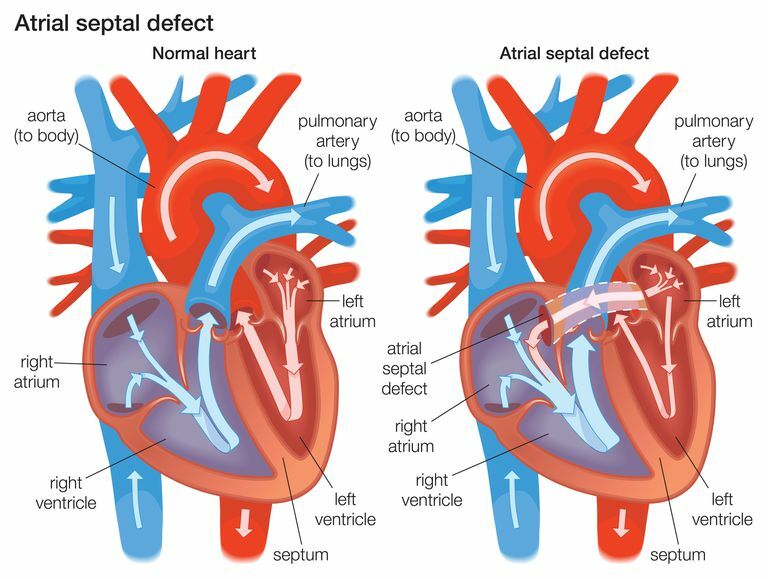 The defect in ASD is a hole in the atrial septum, which is the muscular wall that separates the right atrium and left atrium. In a normal heart, the right side pumps blood poor in oxygen and the left side pumps blood that has been oxygenated. The defect allows the two types of blood to mix, resulting in the blood that travels through the body carrying less oxygen. This type of defect, which is present in approximately 4 to 8 out of every 1,000 babies born, ranges in severity. The larger the ASD, the higher the likelihood of symptoms such as fatigue and shortness of breath. Atrial septal defects fall into three categories. Within each type of defect, the severity may vary. It may be small or large and may require surgery or close without surgical intervention. Only a cardiologist or cardiothoracic surgeon can determine the severity of the heart problem. Secundum ASD (ASD 2 or ASD II): The most common type of ASD, where the defect is located in the middle of the atrial septum. Primum ASD (ASD 1 or ASD I): The second most common type of ASD, where the defect is located in the endocardial cushion area of the septum. This type of ASD is often accompanied by other problems, including an endocardial cushion ventricular septal defect, which means that the defect includes the lower portion of the heart as well as the upper portion. Sinus Venosus ASD (Sinus Venus): This type of ASD occurs in the upper portion of the septum, in close proximity to where the vena cava brings blood to the heart from the body. ASD has no clear cause, but some factors make the heart problem more likely. Some studies show conflicting information. For example, one study shows that smoking by the mother during pregnancy can result in a risk for atrial septal defect while another shows no increase in risk. What is interesting though is that both parents can contribute to the risks of a child developing an ASD with their lifestyle choices. Prescriptions Drugs During Pregnancy: Drugs include busulfan, lithium, retinoids, thalidomide, and trimethadione, as well as insulin, high blood pressure medication, erythromycin (an antibiotic), naproxen (Aleve), anticonvulsants (seizure medications), nitrofurantoin, clomipramine, and budesonide. Many ASDs are minor and cause few symptoms if any. In many cases, a heart murmur may be the only sign that a defect is present. In other cases, symptoms may be severe. This is greatly dependent on the size of the defect. Many of these problems do not show up until the defect has been present for many years, often unnoticed until adulthood. Children are less likely to show symptoms. Atrial Septal Defect. Texas Department of State Health Services. What Are Holes In The Heart. National Heart Lung and Blood Institute. What Is Exploratory Laparotomy Surgery? How Are Umbilical Hernias Treated With Surgery?